Desura Linux client is now out of beta after being in testing for more than 2 months. The final build can now be downloaded from Desura website. The Linux game catalogue includes more than 65 titles across different genres. Linux users were continually reaching out to us offering their support and encouragement as we developed the Linux client. I believe we have created a robust tool to help promote and grow gaming on Linux. After an extensive 2 month beta, we are proud to unlock Desura for all Linux users and shift our attention towards adding to the more than 65 Linux games already offered." said Scott Reismanis the Founder of Desura. I have been using Desura beta client for quite some time. Discovering new games, purchasing them and running them on your favorite Linux distribution is only clicks away and the entire process has been simplified greatly. 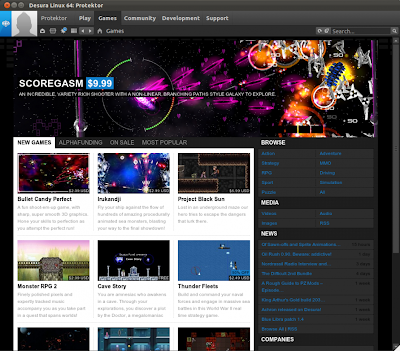 The level of support from Desura team has been tremendous as they have always been accessible and eager to help. Desura client is easily one of the best things that has happened to Linux gaming this year. Also, few days back we reported that Desura client may be open sourced. This is indeed happening and will be released under a Chrome/ium style dual license, GPL v3 for the open source side and a commercial license for the company side where they will hold all the trademarks, logo and other assets. The project has already been setup on GitHub and many wiki pages have been added providing information about brand usage, copyright, coding style etc. The official branch will still be called Desura, any changes besides that will be called 'Desurium'. A press release about the open source client is imminent and can happen anytime soon. A very interesting discussion between Desura devs and community is going on this forum thread. Read if you want to know more about it.